What did we do before television? Radio, of course! But what did we do before Radio? In the fifteenth century a new-fangled invention became all the rage although it would be several centuries before it truly became part of the domestic home scene. Thus, in the eighteenth and nineteenth centuries we see the rise of cheap books and new forms of literature such as novels. Abigail Williams talk focuses on this point of time when reading aloud was not only common, but usual (reading silently was only just starting to be practised). In the eighteenth century domestic leisure was enacted through book groups, tea table parties, amateur dramatics, male ‘punch parties’, and reading aloud. Williams states that the literature on this subject shows that the eighteenth and nineteenth centuries was when silent reading should be seen as becoming more popular, yet Williams points out that many of the popular publications were of books intended for reading out aloud, such as Recitals. It is, however, difficult to study or recover the lost history of reading aloud because people didn’t tend to talk about it much. It was just the way reading was done, not that much different than tying up your shoes. The usual evidence used by book historians also fails to provide much information of use. Marginalia hand-written on the edges of books were rarely made when reading aloud to other people. There was no need for it. Williams paper looks at why reading aloud was common, the ways books were used, and how this reading process reveals a more sociable aspect to domestic life. both for understanding and for action. committee of the Australasian Association for the Digital Humanities. The live stream will be available from History SPOT Podcasts page where there is a video pop-out available. 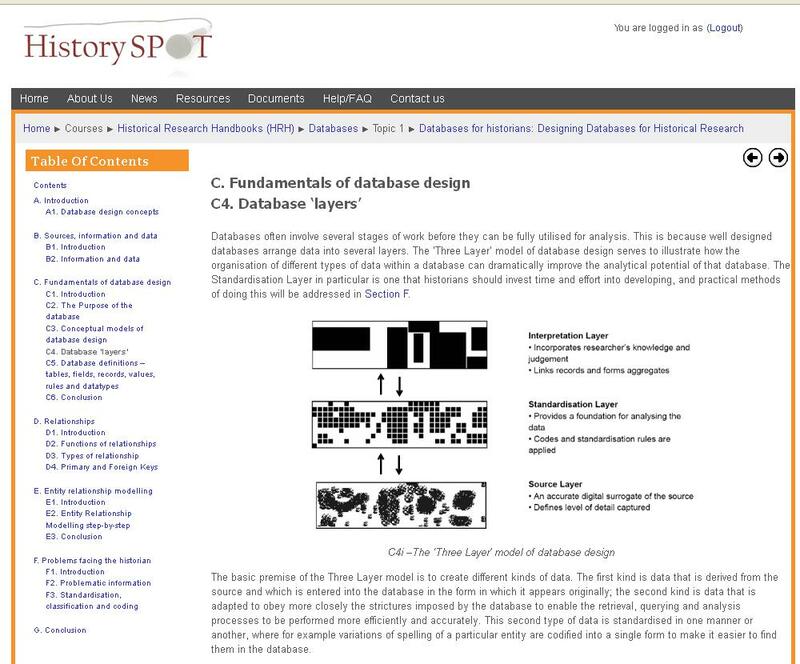 Designing Databases for Historical Research was one of two modules that we launched alongside History SPOT late in 2011. Unlike most courses on databases that are generic in scope, this module focuses very much on the historian and his/her needs. The module is written in a handbook format by Dr Mark Merry. Mark runs our face to face databases course and is very much the man to go to for advice on building databases to house historical data. The module looks at the theory behind using databases rather than showing you how to build them. It is very much a starting point, a place to go to before embarking on the lengthy time that databases require of their creators. Is your historical data appropriate for database use or should a different piece of software be used? What things should you consider before starting the database? Getting it right from the very beginning does save you a lot of time and frustration later on. If you need more convincing then here is a snippet from the module, where Mark discusses the importance of thinking about the data and database before you even open up the software. Each of these functions is a goal that can be achieved through shaping of the database in the design process, and each will require some elements of the database design to be conducted in specific ways, although they are by no means mutually exclusive. And this latter point is an important one, given that most historians will want to have access to the full range of functionality offered by the database, and will likely engage in research that will require all three of the listed types of activity. Or, to put it another way, many historians are unlikely to know precisely what it is they want to do with their database at the very beginning of the design process, which is when these decisions should be taken. This is why, as we shall see later in this section, many historians are inclined to design databases which maximise flexibility in what they can use them for later on in the project (a goal which will come at the price of design simplicity). The data management aspect of the database is in many cases almost a by-product of how the database works, and yet it is also one of its most powerful and useful functions. Simply being able to hold vast quantities of information from different sources as data all in one place, in a form that makes it possible to find any given piece of information and see it in relation to other pieces of information, is a very important tool for the historian. Many historians use a database for bibliographical organisation, allowing them to connect notes from secondary reading to information taken from primary sources and being able to trace either back to its source. The simpler tools of database software can be used to find information quickly and easily, making the database a robust mechanism for holding information for retrieval. This is a guest post by Paul McMenemy, one of IHR Digital’s winter interns from the University of Leicester. By the eighteenth century Norwich was one of the main trading and manufacturing centres of England, if slightly past its hey-day. Like most provincial cities it was to some extent ignored by the mainstream of national history, as it was then emerging. Daniel Howse argues that a different kind of history – a local history arising out of antiquarian practices – catered for such places, restoring or even creating a civic identity related to, but not dependent on, national political trends. The antiquarians’ process of collecting and representing historical papers left them uniquely well-placed to write local histories; and, with their sources’ inevitable bias towards local nobility and local government, these histories tended to have strong sense of civic particularism. Of course, this did not necessarily lead to a host of identical interpretations of local history, but those disagreements which did ensue were based on representations of the city first, and only secondarily on the city’s relation to the national polity. This led to local histories being part of a “vernacular”, a conception of history and politics not only more provincial, but more popular, than the grand national narratives. The eighteenth century is often seen as the era which witnessed the birth of modern history-writing, certainly in Britain. What has not necessarily been made clear is why this should be the case. In the past, the rise of British history-writing has often been seen simply as a by-product of Enlightenment. This attitude has no doubt been encouraged by the fact that its first great practitioner (Clarendon excepted, for reasons we shall see below) was David Hume. However, while a great deal of effort has been expended on trying to understand why Hume came to his conclusions in the field of philosophy – the influence of his environment, of previous thinkers, and so on – there has been comparatively little research into the motivations behind his History of England, and explaining why it differs from previous historical works. Paul Davies suggests that Hume and those who came after him wrote in an attempt to neutralise the still-strong passions of the recent past. As Davies points out, Hume did not begin writing his History with what eventually became its first volume, dealing with the classical and medieval periods, but with those dealing with the accession of James VI of Scotland to the throne of England in 1603, continuing until the Glorious Revolution. Why he did so, and why the period fascinated other writers of the time, Davies ascribes to fears of a Stuart return, reignited by the Jacobite rebellion of 1745. Hume effectively neutralises the martyrology surrounding Charles I in Tory circles, not by demonising him, as Catherine Macaulay was to do, but by portraying him as a noble but flawed man overtaken by circumstances beyond his control. This is not so very different from how he is portrayed by Edward Hyde, Earl of Clarendon, whom many historians would now see as preceding Hume as the first recognisably modern British historian; however, as Davies points out, Clarendon’s reputation as a politician served to obscure his reputation as a historian during the eighteenth century – bearing out Davies’s point concerning the height of feeling surrounding the period – and the political capital made out of his History’s first publication in 1702, coinciding with the Tory revival at the start of the reign of Queen Anne, also tended to blind Whig readers to its merits. By blaming the Stuarts’ politics more than their characters, Hume (and William Robertson – probably the foremost historian of the era – who follows Hume in his treatment of the Stuarts) removes them from the realm of contemporary politics, and transforms what Davies points out was not yet history in the eighteenth century mind into a thing of the past. What Hume also attempts to do – which Catherine Macaulay, for instance, explicitly does not – is change the reading of history from a pastime valued primarily for its morally edifying effects, to a morally neutral pursuit valuable purely in terms of knowledge gained. Until the mid-twentieth century, most historians and readers of history followed Macaulay rather than Hume in this matter. The romanticisation of the early Stuart period which enjoyed a vogue during the later eighteenth century, as evidenced by the fashion for “van Dyck dress” on stage and in paintings by Reynolds, Zoffany, West, etc. – a discussion of which concludes Davies’s talk – can also be seen as a rendering harmless of the once-toxic past, and perhaps as a logical extension of the humanising tendency of Enlightenment historians. As Davies says, however, this was not felt to be the case in all quarters, and the backlash led by Catherine Macaulay’s vehemently anti-Stuart writing – and the republican school of American history which Davies argues she inspired – shows that symbols of the Stuart past still retained at least some of their potency. In discussing this Davies lays bare a paradox: the anti-Stuart backlash which led Garrick to de-romanticise his Shakespearean costume, and the fashionable painters to de-romanticise their historical paintings, produced the opposite effect in historians of the republican school, albeit their romanticisation now applied to the Parliamentarians, rather than the Royalists. Sandwiched between the west and east ends of London, Chancery Lane was a focus point in England’s capital city and therefore an ideal place for lawyers to set up shop. It is hard to imagine what life would have been like there in the eighteenth century. The roads were tight and dangerous and represented an old, much smaller sized London than what had grown up around it over the last 100 years or so. According to Francis Boorman the clash of classes was extremely evident here, with robberies common in its narrow streets as the rich fell foul to the poor, and as a place where women regularly prostituted themselves. There were also many pubs and coffee houses in the district which can only have intensified matters. With a distinct lack of street lighting this was a seedy place to hang around, but it was also a centre of law and order. This paper focuses on the politics of public space in London and particularly its importance to radicals and conservatives in the long eighteenth-century. Francis Boorman argues that Chancery Lane’s geographical and topographical location in London and its specific importance for the legal profession were crucial to its formation as a built environment. Geographically Chancery Lane is located right in the middle of the west and east sides of London and fell under various jurisdictions. Topographically Chancery Lane had narrow but busy streets causing congestion problems and encouraging high levels of accidents. In addition Chancery Lane was viewed as the physical manifestation for the reputation of the lawyers who worked there. For example building works by lawyers gave manifest significant criticism of the legal profession from the public. People felt that lawyers were improving their place of work and getting rich off of other people’s money. In the long eighteenth-century there was a very real perception that lawyers were dishonest, greedy, and untrustworthy. Boorman explains all these issues in clear detail to show why the expansion and improvement of the road took so long to be achieved. Even despite the money and workforce available through the Westminster Paving Committee and numerous complaints that the Lane was dangerous (especially near Fleet Street) nothing happened. The main reasons for this was arguments between the local residents and the lawyers on who should pay as well as the difficulty of convincing the various jurisdictions under which Chancery Lane fell that they should act in unison.